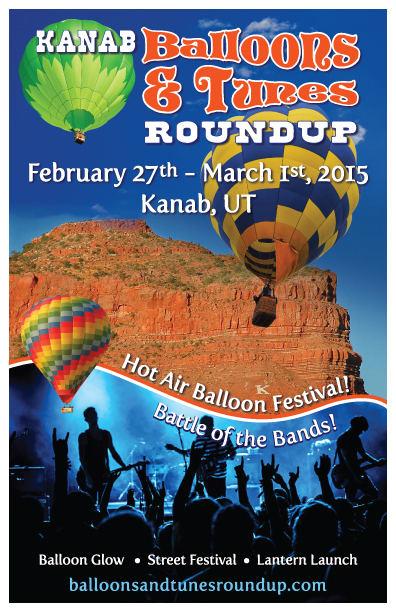 KANAB — Live music, great food and a street fair will be among the highlights of the first-ever “Balloons & Tunes Roundup,” a three-day event featuring hot air balloons and a “Battle of the Bands” competition over the weekend of Feb. 27-March 1. Balloons will launch at approximately 7 a.m. daily, weather permitting, from Coral Cliffs Golf Course at 755 E. Fairway Drive, Kanab. The location will provide participants with the dramatic sites of Vermilion Cliffs, located near the Grand Staircase-Escalante National Monument. 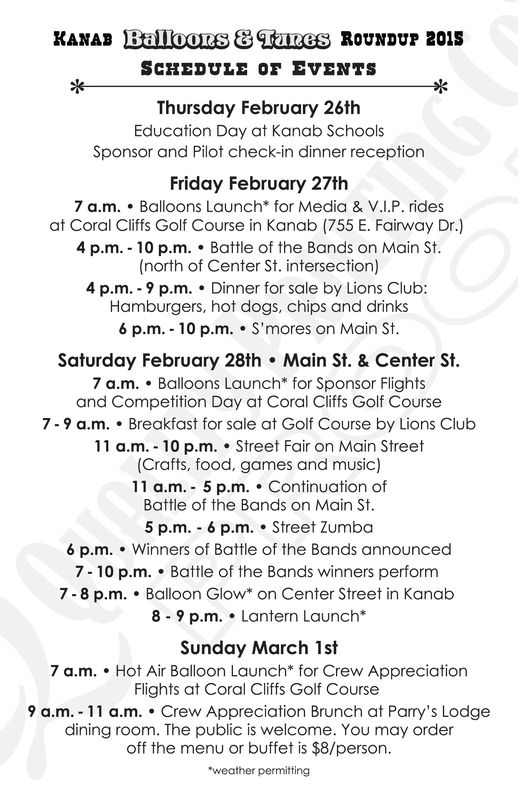 Events held later on Friday and Saturday will include the “Battle of the Bands” competition, crafts, foods and games at a Street Fair on Main Street and even a Street Zumba demonstration on Saturday. Hot air balloons will line Center Street on Saturday at 7 p.m. for a traditional Balloon Glow exhibition. Out of the 20 balloons, 15 of those attending will fill up and glow for spectators to enjoy the vibrant balloon colors in the starry night sky of the desert. All of the events associated with the“Balloons & Tunes Roundup” are free. There will be vendors selling food, refreshments, games and toys for kids, souvenirs and lanterns. And, weather permitting, there will be a lantern launch on Saturday evening following the balloon glow. Balloon flights are for exhibition; rides will not be available for purchase. Kane County is the gateway to three national parks, five national monuments, a renowned national recreation area, two state parks, two national forests and unlimited outdoor adventures. Kane County is truly “The Heart of the Parks.” In every direction, there are breathtaking views; the unique vistas of the Grand Canyon to the south, Zion National Park to the west, Bryce Canyon National Park to the north and Lake Powell and Glen Canyon to the east.